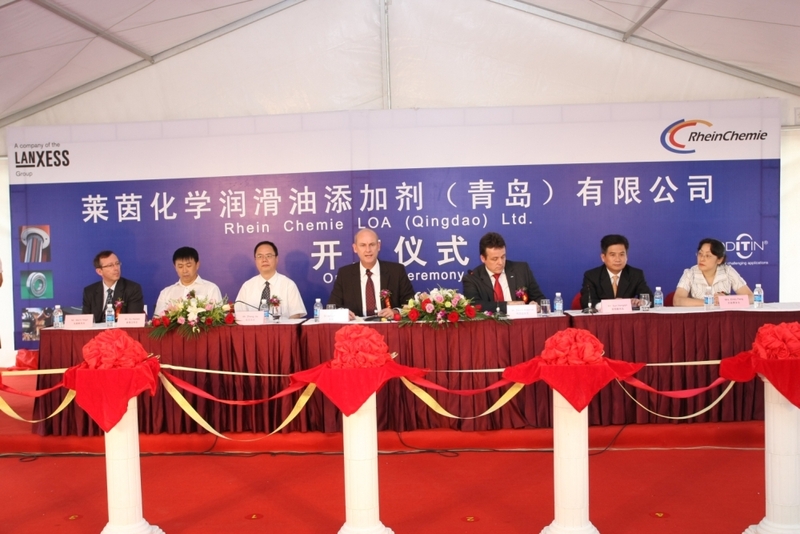 September 8, 2009 marked the official opening of Rhein Chemie LOA (Qingdao) Ltd., the company’s new production facility for lubricant additives in Qingdao, China. “We aim to benefit from the above-average growth in China’s industrial lubricants segment. Our strategy focuses on offering customers in China and other countries in the Asia Pacific region a customized range of high-quality additives for industrial lubricants. Our well-equipped applications laboratory enables us to offer a unique portfolio in Qingdao,” says Dr. Anno Borkowsky, CEO and President of Rhein Chemie Rheinau GmbH in Mannheim. In Qingdao, Rhein Chemie manufactures customized additive formulations for industrial lubricants that are known the world over under the brand name Additinâ. These formulations improve performance and service life in industrial applications and help protect the environment. The Rhein Chemie additives are used in metalworking fluids, corrosion inhibitors, greases, and hydraulic, industrial gear, turbine and compressor oils. When the Rhein Chemie Group built its new state-of-the-art production facility in Qingdao, it naturally insisted on maintaining the same high plant safety standards that apply to all its operations worldwide. Rhein Chemie also established a highly efficient applications laboratory for additive development and lubricant testing in Qingdao, where a large number of internationally standardized and special test methods for industrial lubricants are performed by experienced experts. “Individual additive formulations are developed in close cooperation with customers, who thus benefit from Rhein Chemie’s know-how,” states Dr. Lixing Wei, Director of Technology Greater China at Rhein Chemie’s Lubricants Division underlining the major contribution the laboratory makes to the success of operations. “We have already successfully developed new products here – for example the water-miscible metalworking package Additinâ RC 5700,” he adds. Rhein Chemie LOA (Qingdao) Ltd. obtained licenses from the Chinese authorities in April 2007, and work started on the new production hall in November 2007. Commissioning took place on schedule, in November 2008, and the new applications laboratory was completed this spring. Rhein Chemie has invested around EUR 5 million in this project. The newly founded Chinese company Rhein Chemie LOA (Qingdao) Ltd. began production of additives for industrial lubricants at the end of 2008. Rhein Chemie manufacturing operations in Qingdao started back in 1999 with the production of additives for the rubber industry and have continued to expand ever since. Rhein Chemie now employs a workforce of around 180 in Qingdao. LANXESS is a leader in specialty chemicals with sales in 2008 of EUR 6.58 billion and currently 14335 employees in 23 countries. The company is represented at 46 production sites worldwide. The core business of LANXESS is the development, manufacture and sale of plastics, rubber, intermediates and specialty chemicals.